The other night I was watching my VHS copy of Sudden Death (1995). This was my first time ever seeing it. The movie stars Phantom Cardboard favorite Jean-Claude Van Damme. If you’re like me and have not seen this then without spoiling it too much for you the movie is basically Die Hard set inside of a hockey stadium during Game 7 of the Stanley Cup Finals. It’s a pretty decent movie in my opinion. I watched this movie just to watch a movie. Like most VHS junkies I’ve got more tapes then I’ll ever be able to watch by virtue of picking them up from thrift stores for pennies on the dollar. Never the less, I watch new tapes as often as I can so they’re not just looking all pretty on my bowing shelves while collecting dust. The point is I really had no intention of making a card from this movie, I was just getting the return on my $.10 (probably) investment. 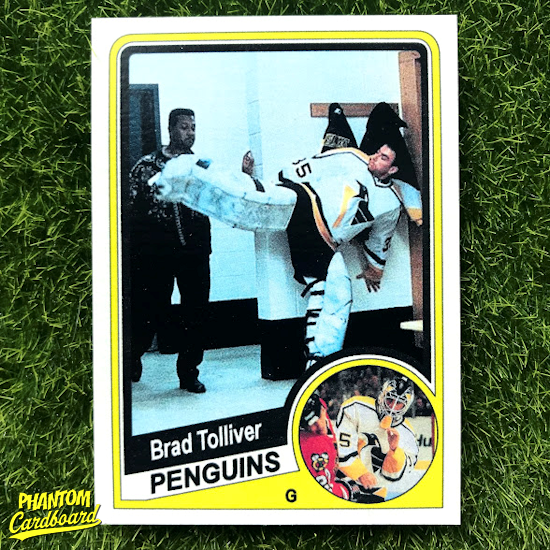 Then Jean-Claude had to go and disguise himself as Penguins goalie Brad Tolliver (played by former NHL’er Jay Caufield). Yep. That’s gotta be a card said me, to me. 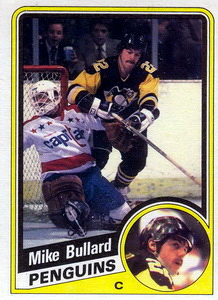 For this one I used a favorite of mine, the 1984 Topps hockey inspired design. No designs from 1995 were going to work as well as this one did for my tastes. The main picture is great with JCVD karate kicking one of the baddies in full goalie pads. Only thing that could have topped that would be him doing his patented splits in the goalie get-up.